Tamatanga opened a couple of months ago, in between the Mailbox and Grand Central, a road I often walk along. I noticed the lovely green frontage straight away and set about looking into which restaurant was opening there. It's an Indian restaurant, selling curries, biryani, thalis and so on, but a chain in the manner of Las Iguanas, Turtle Bay etc. 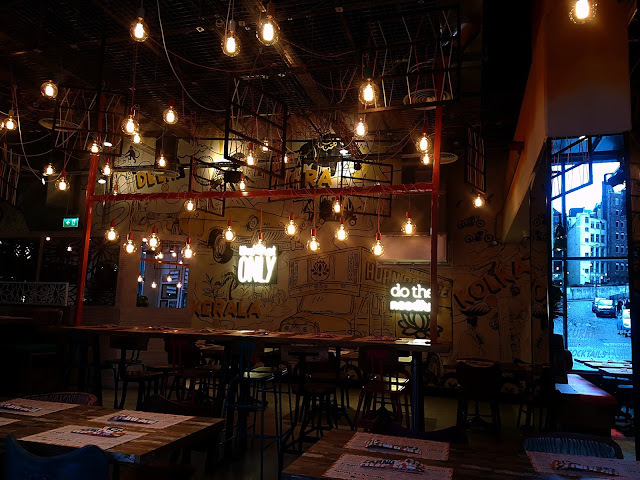 It's cheerful, friendly, non-intimidating and you'll see something you recognise on the menu. The bright colours, graffiti-type wall paintings and trendy lights give you the impression that this is Indian street food and there is an element of that, alongside curry bowls and other items you'd expect to see at an Indian restaurant. On this occasion, I just had a water to drink, but there's some fun sounding fruity cocktails that I'll try another time. I wasn't intending to have poppadoms and chutney (£2.95) but when the waitress suggested it, I said yes immediately. 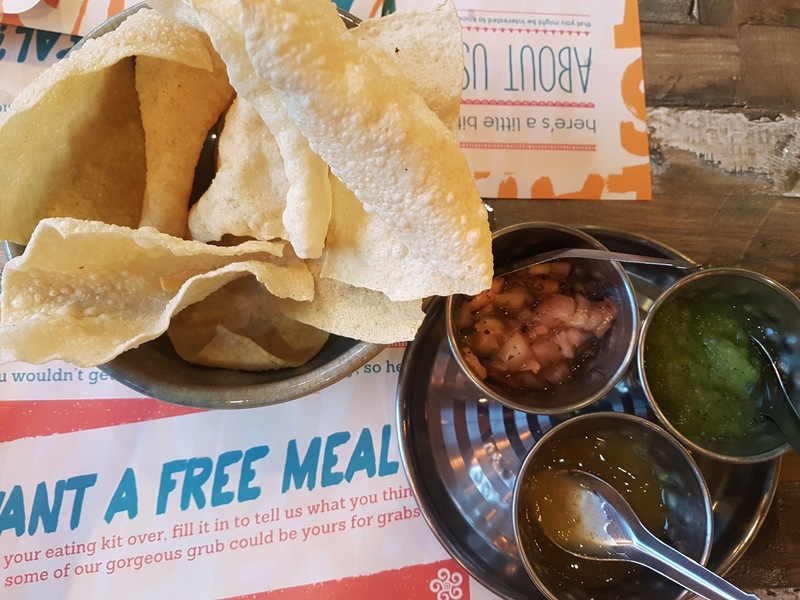 A generous bowl of melt-in-the-mouth poppadom shards appeared alongside mango chutney, an onion relish and a cooling mint dip with an interesting texture. 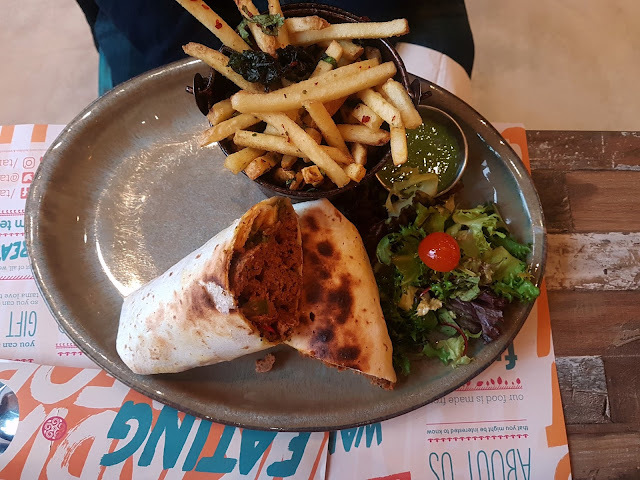 Tamatanga have an excellent Daytime Deal , which is £8.95 for a soft drink and a curry bowl, biriyani bowl, salad bowl or wrap. There's the option to pay extra for alcoholic drinks, seafood or one of the clay oven dishes, but I kept it simple on this occasion. 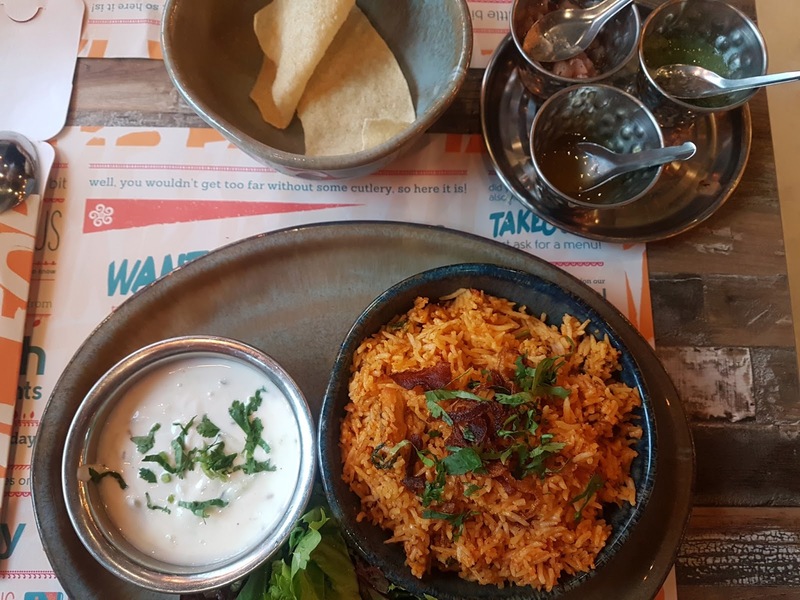 I chose a bottle of sparkling water alongside the chicken biriyani, (£10.75 without the deal) which turned up with a massive bowl of raita and a little bit of salad- I could have done with less of the former and more of the latter. 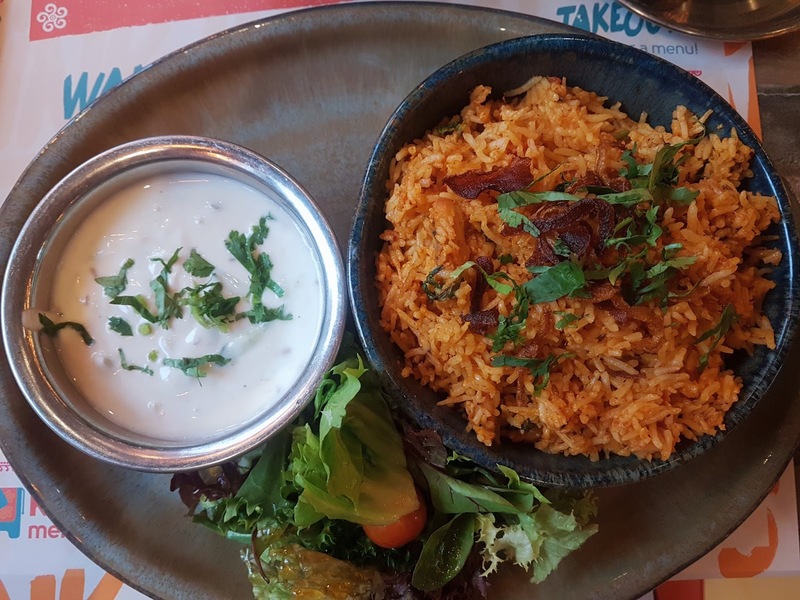 A biriyani is an aromatic baked rice dish. Mine contained chicken (thigh I think, which is much tastier than breast) and was pleasant with a slightly tingly after-taste. I enjoyed mixing the raita in to mix up the texture. It didn't blow me away but it was filling, pleasant and a bargain. I was with my friend James, who picked a lamb wrap (£10.45 without the deal), thinking he was picking something light! As you can see, it was pretty densely packed with lightly spiced lamb mince. He enjoyed it, it was tasty but it was super filling. Served with fries, this is a hearty plate of food. Overall I enjoyed my lunch at Tamatanga. It didn't knock my socks off but I liked the friendliness of the staff, the bargain price and the poppadoms were excellent. There's plenty of choice on the menu, so I'll look forward to heading back and trying some small plates and something from the clay oven menu. Food was paid for by myself and my friend and they did not know I would be reviewing. Photos my me on my phone.